Mangaluru: Eight persons have been arrested by the police in connection to the clash reported from Madani Nagar in Ullal Police station limits on Saturday April 13. The clash which started after a car returning from Modi’s rally in Mangaluru city collided with a two wheeler being driven by a lady belonging to another community which gave rise to an argument between those in the car and the locals. A bus transporting BJP workers reached the spot on its way back from Modi rally at Nehru Maidan when it was attacked by stone pelting. It is also alleged that some women in the bus were assaulted. Altogether fiver persons were injured in the incident. 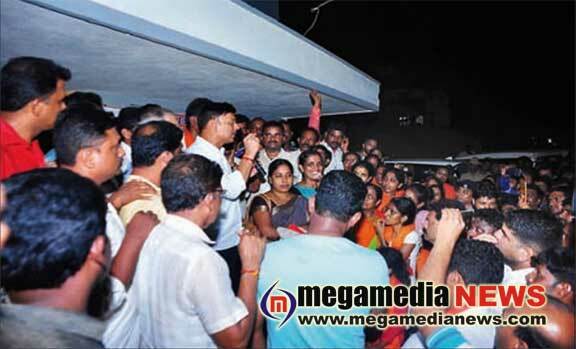 Pro Hindutva groups protested at Konaje police station till late into the night and withdraw their protest only after getting assurance form the police commissioner Sandeep Patil.